Ingredients are simple, a bar of coarse laundry soap, a cup of borax and a cup of washing soda and some water. That's it. My grocery store actually keeps them together. 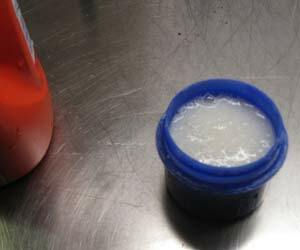 Although we call it soap making, making laundry detergent is not really "Making Soap" It's actually mixing various cleaning materials together. There is no chemical reaction that takes place so if you don't measure perfectly it's not a problem. Get your bar of laundry soap (or use up soap scraps from your soap making experiments.) It's yellow soap that has no perfume. If you have leftover soap you have made that is fine too. You could also add leftover bits of broken soap ends. You need a bar of 5-6 ounces but size is not critical. We get an Italian brand here, but many brands are available. Sunlight is another brand. Check the laundry detergent aisle. Sometimes old fashioned hardware store has it. Grate it using a cheese grater or coleslaw maker or shave it into really small pieces. It grates quite well. I've heard of some people using a food processor. Put it in a bucket and add about a gallon of hot water. Again the amount is not critical. There should be enough water to cover the shredded soap then some. This will soften the soap. Mix it well and let it sit overnight. You want to see your bits of hard soap dissolved into a slimy goop with no soap chunks left. Mix it and add more warm water if you have to. Some recipe say melt the soap and water over low heat stirring constantly until melted. I did not do this but heating would work fine. Get a pack of Washing Soda. Don't substitute baking soda, it's not the same thing. Our brand here is Arm and Hammer but the brand is not important. You also need a pack of Borax, our brand is 20 Mule Team.You will need a cup of Washing soda and a cup of Borax and more hot water. Borax, is an umbrella name for a number of closely related compounds of Boron. It is also known as sodium borate, sodium tetraborate, or disodium tetraborate. It is a mineral that comes in soft colourless or white crystals that dissolve readily in water. Borax occurs in deposits left by the evaporation of seasonal lakes. It can also be manufactured. Borax occurs in many countries. Borax is used for many purposes. Here are some: food preservative in some countries but banned in the US, flux in jewelry making and gold extraction, household products such as laundry soaps and cosmetics, cockroach repellant and killer, anti-fungal, fire retardant coatings, glazes and enamel, moth proofing and many many other uses. It is mildly toxic when ingested and can cause respiratory damage over time if dust is inhaled. It is not generally considered a dangerous material but care should be taken when using it. It has been mainly implicated in reproduction problems. All laundry detergents carry some risks. These are played down by detergent manufacturers. Treat these helpful materials carefully. More info on Borax Toxicity from Crunchy Betty! Add the Washing soda and the borax and more water to the soap and stir until everything is dissolved. At the end of the process you will end up with about a 5 gallon pail of laundry soap. It is quite thick. I keep an old plastic bottle with a wide mouth and fill it when I need to from the 5 gallon pail. Lately I have used a large jug that holds lime juice for restaurants and bars to keep my big batch in. The mixture tends to separate slightly so you need to shake it a bit before you use it. Otherwise this home made mixture is every bit as good as bought detergent and has no phosphates. It does not create suds so it works well in the new front loading machines. I use about as much as I used bought laundry soap. I have a High Efficiency washer and I've not had any trouble. Get together with a friend to make your soap and split the washing soda and borax. You will have enough to last for a good many batches. It's very inexpensive too. The quantities can be made in smaller amounts if a 5 gallon pail is too much for you. It keeps well so I just keep it in the basement beside the washing machine. Some recipe suggest adding baking soda as a white booster. I don't know if this works since I've not tried it. If you live in an area of hard water, some people suggest adding some extra washing soda. I have soft water so I have not tried this either. Instead of dissolving the soap in water, it is grated extra fine and all the ingredients are mixed together dry. That's it. Put it in a jar and keep your pets and kids away from it. You only need a spoonful because it is concentrated. When using this soap it helps to dissolve it in a bit of water before adding to the wash. I calculated the cost per wash and my soap came to less than 5 cents per load. Give it a try and see. This article is provided for information and entertainment only. I am not an expert on soap making, just someone who has successfully done it several times. Some soap recipes I've had good success with These are small quantities not big batches. David Suzuki Foundation laundry soap recipe and instructions. Another site with instructions This person actually does a side by side test with commercial detergent. Another recipe This time it's for a dry version. The recipe is much the same. Article on Borax as a mineral. My Soap Making Page I've made several fabulous bars of soap and have had a ball doing it. THE Soap making website compiled by Kathy Miller. Recipes, directions, soap, lots of really useful content. Virginia Tech and USDA Forest service PDF on Catnip.